If you think of the Unprocessed Challenge as a long list of foods you can’t eat anymore, change your perspective! Think of it instead as an opportunity to discover new foods prepared in ways you never considered before. But where do you start? One way to find exciting new-to-you ingredients is by exploring new cuisines. When you travel the world through your food, you might find yourself eating unprocessed without even thinking about it. For example, I am currently co-managing, along with Sarene Wallace, a virtual cooking community called Tasting Jerusalem that is exploring Middle Eastern cuisine through the lens of the wildly popular Jerusalem cookbook by Ottolenghi and Tamimi. If you pick up a copy and scan through it, you’ll realize the ingredients are real food combined in unique, sometimes mind-bending ways that will nearly always make your taste buds do the happy dance. Occasionally there is an ingredient, like sugar, that you will have to adapt to meet your personal unprocessed rules, but otherwise, it is practically a bible of unprocessed recipes. Our Tasting Jerusalem group focuses on a unique ingredient each month as a way to learn more about the cuisine and the cookbook’s recipes. Recently, our monthly topic was pomegranate molasses. Think of it as the balsamic vinegar of the Middle East. A centerpiece of Persian cuisine, but present in so many dishes throughout the entire region, it is tart, tangy, just a little bit sweet, making it a perfect addition to your salad dressings, stews, grain dishes, and even desserts. It can be purchased in Middle Eastern markets or specialty food stores but may have added sugar. According to Louisa Shafia, who wrote the recently released “The New Persian Kitchen” pomegranate molasses can easily be made at home. Just boil pomegranate juice on medium high heat to reduce it quickly down to a syrupy consistency, or medium low heat to reduce it more slowly with less chance of overcooking. (I recommend the low and slow approach the first time.) When it is thick and syrupy, coating the back of a spoon, you are done. Bottle it up and store it in the refrigerator since it is preservative-free. During our cooking group’s pomegranate molasses month, I created a salad dressing, combining the molasses with balsamic vinegar and then topped a seasonal green salad with it, used it in a quince and lamb meatball dish adapted from the Jerusalem cookbook. And finally, added it to my own roasted fruit recipe. The roasted fruit would be a perfect unprocessed snack item – you can make a large batch, store it in the fridge and use it for breakfast, lunch, snacks, or dessert. Inspired by a roasted fig recipe from David Lebovitz, I improvised a new approach to the fig recipe using a combination of fruits and a syrupy sauce comprised of pomegranate molasses, a little port, and some honey – an approved unprocessed sweetener. The colors and flavors of the caramelized fruit are striking and you’ll love the fruit’s versatility – a yogurt parfait in the morning, a scoop all on it’s own for an afternoon snack, or served on top of your favorite real ice cream for dessert. As stone fruits and figs quickly go out of season, do not despair. Imagine how delicious this would be with baked apples. Even better, grab a bunch of red grapes, roast them, and be happily surprised by your newly created cheese accompaniment, side dish for roast chicken, or just a simple snack all on their own. For more ideas of what you can create with pomegranate molasses, check out these other articles and blog posts. And for more ideas of new ingredients to add to your pantry and cooking rotation, check out our Tasting Jerusalem group on FB, G+, and Pinterest or under the hashtag #TastingJrslm on Twitter and Instagram,. Or go cookbook shopping and be inspired by new approaches and new ingredients that will broaden your choices of tempting unprocessed foods you can cook, eat, and enjoy. 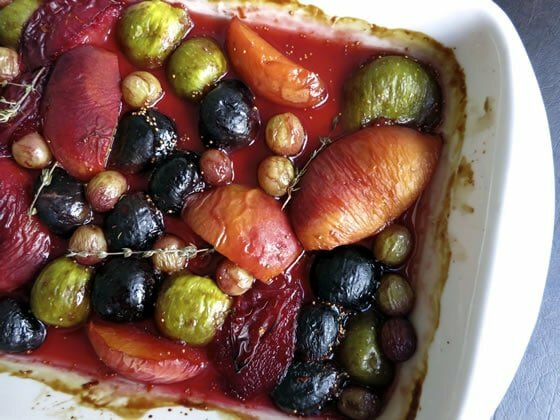 Inspired by a roasted fig recipe from David Lebovitz, I created a variation by adding stone fruits and grapes, pomegranate molasses, and port. 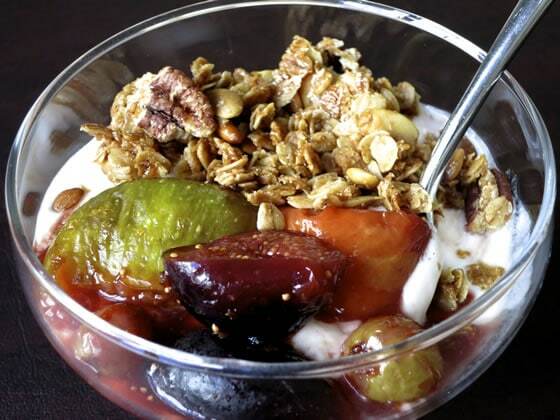 Think of it as a fruit crisp, without the crisp topping. It's simple to put together, can be made ahead of time, and is perfect for breakfast, lunch, snacks, or dessert. The amount of each type of fruit is approximate, you can vary the quantities of each based on what you have at hand. In the winter, I would think some apples or firm pears with a scattering of raisins or currants or cranberries would be delicious! 1 cup red grapes approx. Wash and slice the fruit. Preheat the oven to 400 degrees F convection roast or 400 degrees F regular bake. Grease a 9 X 13ish baking pan with a dab of olive oil, blood orange if you have any. Lay the figs flat side down in the baking pan and scatter the rest of the fruit around the figs. In a small bowl whisk together the pomegranate molasses, honey, port, and orange zest. Pour the molasses mixture all over the fruit. Lay the thyme sprigs on top. Cover with foil and put in the oven for 10 minutes*. After 10 minutes, loosen the foil but leave it on and bake for another 10 minutes. Then take the foil off, slosh some of the pan juices on the stone fruit slices if they are a bit dry then let it cook for 5 more minutes. Check and cook for 2 more minutes if needed. Fruit should be bubbling and just starting to turn a bit dark on the edges. A minute less or more will not matter. Remove from oven and let cool before devouring or putting in a container and saving in the refrigerator. I used convection when I cooked this both times - if you don't have convection or prefer not to use it, add 3 - 5 minutes to the cooking time at each 10 minute foil stage. You're looking for the juices to have emerged and to start vigorously bubbling when the foil comes off. Each oven is so different, that it's best to look for visual cues than to follow exact times, whether using convection or regular bake. Beth Lee is the kitchen-table storyteller you wish lived next door. Formally a Silicon Valley marketing professional, in 2010 Beth realized she’d rather talk about pita chips than memory chips and started her food blog OMG! Yummy. Beth is also a freelance writer, teaches cooking classes, and co-leads a worldwide virtual cooking community called Tasting Jerusalem that explores Middle Eastern Cuisine. You can find Beth talking about food on Facebook, Instagram, Pinterest, and Twitter. Wow – wait until you read my post – I could have made my own pomegranate molasses! Next time, for certain, I will do just that. Can’t wait Liz – you always have such creative interpretations of seasonal ingredients! Beth, you are so inspiring! I have pomegranate juice in the fridge and I’m making pomegranate molasses this afternoon. Perfect for October Unprocessed! 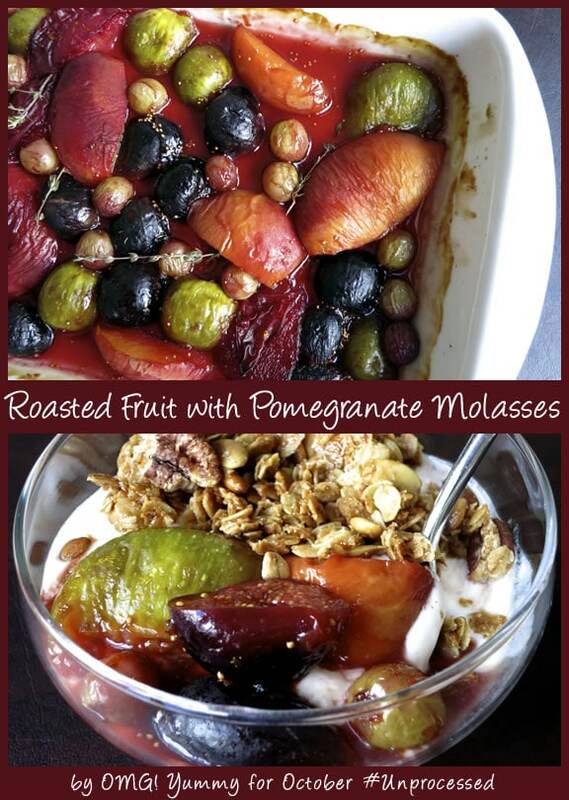 Your roasted fruit sounds just divine – figs and port and pom molasses? Oh yes. You and Sarene have created an amazing community with Tasting Jerusalem and I’m so happy to be part of it. Hannah – Our Tasting Jerusalem community and this Unprocessed community are only as strong and inspiring as our members. I do believe we inspire each other! Let me know how the molasses comes out. I found the other day that about a 75% reduction works. It tasted wonderfully tangy with nothing added, but I could also imagine that just a touch of a sweetener or lemon juice would be lovely too. Thank you for the pomegranate molasses discussion and recipes. I recently bought some with the intent to be adventurous but haven’t had a chance to research any recipes. Can’t wait to try this recipe and your other links. Just this morning I roasted strawberries with pom molasses and a touch of vanilla. Yum and so easy! Be adventurous – think balsamic vinegar and then use pom molasses instead! Oooh, I love pomegranate molasses but I’ve never cooked with it in sweet applications like this, only savory. Normally I use it in a magical BBQ sauce from Vegan with a Vengeance. But I love the idea of serving it with my oatmeal or yogurt. Oh BBQ sauce sounds like a wonderful way to use it! I roasted strawberries with it this AM – wanted to put it on oatmeal so badly but have a bug in my brain about putting the roasted strawberries in banana muffins so I am saving them until I can bake later today or first thing tomorrow.